1350 march against separation of immigrant families on Father’s Day in Minneapolis | Fight Back! Minneapolis, MN - In sweltering heat, 1350 people marched to protest the separation of immigrant families on Father’s Day in Minneapolis. In recent weeks, the Trump administration has begun separating all children from their parents at the U.S.-Mexico border. This has produced a wave of outrage across the country which is now starting to manifest in large protests in many cities. 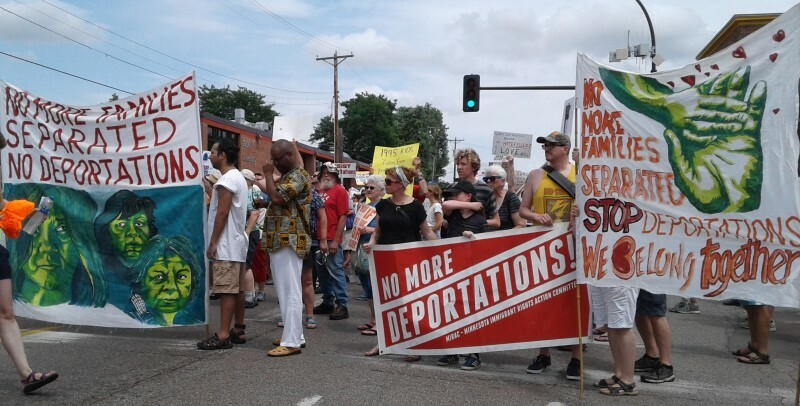 The Minneapolis protest, organized by the Minnesota Immigrant Rights Action Committee (MIRAC), started outside the Republican Party office on Franklin Avenue and marched to Democratic Senator Amy Klobuchar’s office on the east edge of downtown. The Trump administration on the federal level, and Republican gubernatorial candidates Tim Pawlenty and Jeff Johnson on the state level, have adopted immigrant-bashing as a central strategy. The protest was focused on the separation of immigrant youth from their parents at the U.S.-Mexico border as well as raids and deportation of immigrants around the country, which also result in separation of families. Because the issue is the separation of families, and because it was on Father’s Day, there were a large number of families with children present at the march.